Beside the abundance of museums covered in our separate article, there are some great examples of period architecture, some of which have been restored in recent years and some which are still partially intact, enabling you to at least get a feel for the history of this ancient city. Lefkoşa is believed to have begun as Ledroi in around 280 BC, and was further developed during the Byzantine era and further still by the various occupiers of the subsequent centuries, and has always been a place of importance. Kyrenia Gate is an interesting first stop, which is where the entrance to the city was based after the Venetians fortified the city with walls, and you can still see the date of its construction in 1562 on a plaque above the entrance. 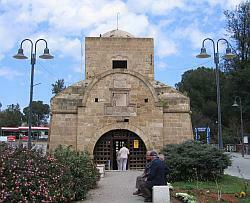 Kyrenia Gate now houses the Tourist Information Office for the city. As you enter the city via the gate you will immediately see monuments to Atatürk and Dr Fazıl Küçük, a famous Turkish Cypriot who represented his people in the 1950’s and was the first Vice President for Cyprus. Further along travelling up the Girne Caddesi on the left hand side you will see the domed Mevlevi Tekke Museum which houses a collection of artefacts from the sect of whirling dervishes who used this building. Continuing to the top of the road you will reach the city Meydanı or Square. In the middle of the roundabout is a Venetian column made from granite where you can see the coat of arms at the base, with a newer British installed copper globe at its peak, rather than the original Lion of St Mark which had previously adorned it. There are also some very interesting buildings in this area too, which you may be able to tell are from the British colonial era. Other places of interest include the Arabahmet Mosque, (named after the architect of the Mevlevi Tekke), which is of Byzantine construction and is strangely paved with some gravestones taken from other churches, some of them coming from the original Venetian church which originally stood on this spot. 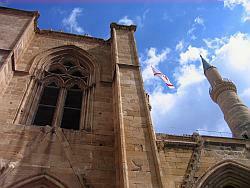 Right in the centre of Lefkoşa and sitting within the Green Line is an Armenian Church probably originally built around the 14th century. You can see it from both north and south, and although in bad condition at present, there are apparently plans to restore it. 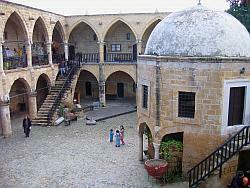 The Büyük Han or Great Inn is another popular place to visit, and has been well restored. Originally built in around 1572 as a stop over centre for travelling merchants with accommodation, stabling for horses and camels, warehouse and market, it’s a two storey building with a central courtyard in which stands a small octagonal mosque. You can now browse around the handicraft shops and partake of some well-earned refreshments whilst taking in the peaceful nature of this place, or attend one of the intimate musical festivals during the year. 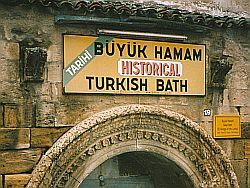 You may also pass by the Turkish Bath or Buyuk Hamam, but you need to have your eyes peeled as its entrance sits slightly below ground level. It is apparently still in use today, although whenever we have been we have not seen a soul enter! 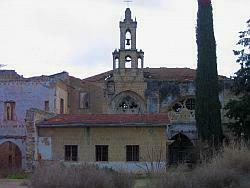 It actually used to be a 14th century church called St George of the Latins. Selimiye Mosque in the city centre is a wonderful building, built as a cathedral named St. Sophia in around 1209, it was finished in later years by French architects who were travelling with the Crusades. Sacked in the 1300s by the Genoese and then the Mamelukes, it also suffered earthquake damage and was subsequently trashed by the Ottomans in 1570, when it was thereafter altered with the addition of minarets and changed into a mosque which still functions as such today. 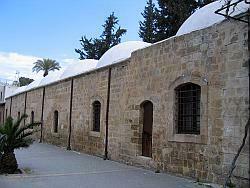 In between the mosque and the indoor market area you will find the Bedestan or St. Nicholas Church, it was originally a 12th century Byzantine building, although altered and added to during the Lusignan period. It also suffered the same fate as Selimiye, suffering earthquake damage and then being left to decay during the Ottoman era. It is now part of a restoration project which should bring this wonderful structure back to life. The Gamblers Inn or Kumarcılar Han is a late 17th century building, again used as a centre for travellers of a certain trade. It is assumed that this building was built on top of the remains of a monastery as it has a gothic arch still remaining. As of 2008 this site is set for restoration, and if it is done as carefully and thoughtfully as the Büyük Han, then you should be able to sample the original atmosphere when it’s complete. The Eaved House and Haydar Paşha Mosque are other restored buildings worth a visit, as they now form part of the burgeoning arts scene in Lefkoşa, regularly hosting exhibitions and displays. 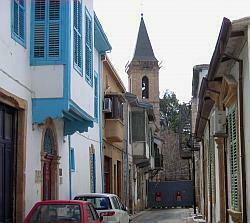 The Turkish Cypriot Folk Arts group HASDER also has its home at the old St. Luke’s Church built in 1758 during the Ottoman era. To appreciate the recent history of Lefkoşa as a divided city, the Ledra Palace Crossing is definitely a place of interest for many. As you walk across no man’s land or stand in the small park nearby you can see the old Ledra Palace Hotel which is now occupied by UN soldiers, and see all the old buildings which were shot up during the military intervention. It’s quite a strange experience the first time you walk across this border…it’s eerie and a bit strange, but some of the buildings, with sand bags and oil drums still intact, were very attractive in days gone by. That sums up our round-up of the places of interest in Lefkoşa, but there are many more to see so we will leave you to seek them out! You can also join walking tours of the city, or follow the Blue Line walk which will take you past many of the sights we have mentioned. Please click any of the links within the article to find out more about a particular item, or visit our other articles on museums and places of interest in Kyrenia, to the east of Kyrenia, west of Kyrenia, Famagusta and the Karpaz.